My daughter Annika is headed to college this fall, and she refuses to answer the phone. No, not even for dear old Dad! These days, we’ll occasionally talk on the phone when I’m out on the road—but to really keep up consistent communication, I’ve learned that text messaging is the way to go. And this trend doesn’t only apply to young millennials like Annika. Mobile usage studies have found that Americans are sending texts five times more often than they’re picking up the phone. Chances are if your customers don’t want to pick up the phone to chat with family and friends, they’re even less likely to do so for your customer service representatives. That’s why, just like I do with my daughter, it’s critical that brands connect with customers where they are. 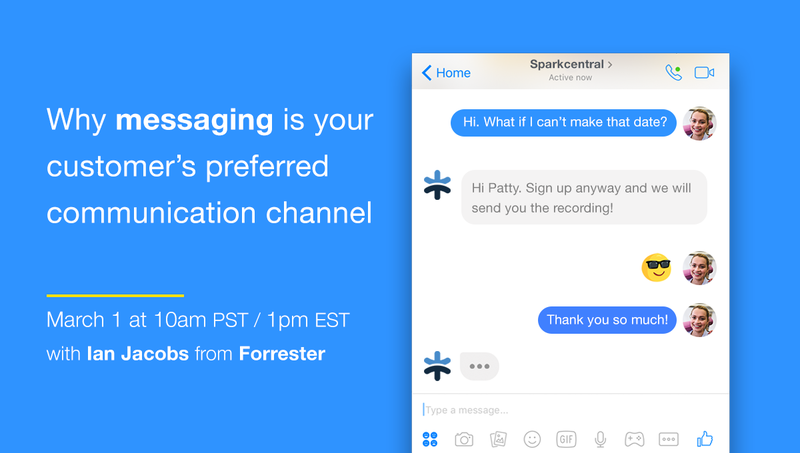 On Wednesday, March 1st, Ian Jacobs from Forrester will be delivering a fantastic webinar about why messaging is your customer’s preferred communication channel, and why including this channel among your customer experience touchpoints is a high returning investment for your business. Your customers are busy (and love to multitask). When customers have a problem with your product or service, it’s inevitably an interruption to their day. With every minute they spend sitting on the phone to solve this problem, your customer’s to do list continues to stack up—and their opinion of your company begins to fall. To minimize interruptions, customers need to be able to solve problems quickly, preferably while also being able to get on with their day. When customers can message with support in one browser tab while continuing their work in another—even if they receive the exact same support in the exact same time frame—the perception of their day’s interruption is minimized. Written instructions are easier to follow. In order to solve the problem at hand, you may need to give your customer some instructions—and they may not be free to follow up right in that moment. Receiving instructions by phone would require the customer to take notes that may or may not make sense later on. With clear, written instructions that can be saved for later use, customers can more easily follow the steps provided with minimal confusion. Customers have phone support PTSD. And unfortunately, that’s exactly why customers reflexively wince in anticipation of a call to customer support. Even if your company has a stellar track record of top-notch phone service, many customers have internalized some degree of phone support PTSD. By offering customers the chance to start with a messaging option (and switch to a phone call with a specific representative only if necessary), you remove the hurdle of this negative association. Are you ready to move beyond phone support as your primary method of connecting with customers? Save your spot now for Why Messaging is the Preferred Communication Interface for Your Customers to start communicating with your customers in the way that works for them.